This 280-seat auditorium serves as the perfect venue where those invested in the advancement of healthcare education and delivery can participate in conferences, seminars and courses. Four fully-outfitted Operating Rooms provide opportunities for advanced students to practice life-threatening, high-risk, low-frequency events that are infrequently available to them in the clinical practice sites. Students encounter “patients” with a wide range of medical and surgical conditions in the Critical Care area, consisting of the Medical-Surgical Unit, the Telemetry Unit, and the Intensive Care Unit. The Helene Fuld Skills Resource Center allows students to practice and master both basic and advanced clinical skills and techniques and procedures in a safe environment. 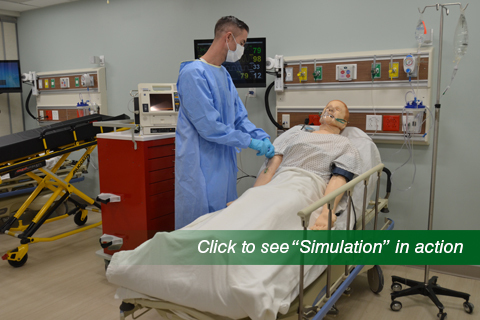 The opening of the University of Miami School of Nursing and Health Studies' (SONHS) new Simulation Hospital on the Coral Gables campus on September 28 signaled a transformation in the education of healthcare professionals. The five-story, 41,000-square-foot, fully equipped facility will serve as a hub for students, healthcare professionals, first responders and corporate partners to design, test and master skills and technologies to transform healthcare education, research and practice. SONHS Simulation Hospital Construction Project Highlighted in "School Construction News"
Topping out of the University of Miami School of Nursing & Health Studies' Simulation Hospital is featured in School Constructions News, a news magazine devoted specifically to educational facility construction and operations.